« The Backstory: going cold turkey on Thanksgiving? I am part of the last generation to grew up with a lot of rules about personal conduct. We had dress codes at school and couldn’t wear jeans, t-shirts or anything with advertising on it. Girls had to wear skirts and boys had to wear pants. Hair could not be grown below the top of your ear (for boys) and had to be pulled back off the face for girls. Shoes had to be shined even if they were worn out and clothing was ironed no matter how old. After school we were expected to change into “play clothes” before going outside. There were a lot of rules at the dinner table too. Breakfast was usually pretty casual and as long as you didn’t spit up all over the table dad or mom wouldn’t pay much attention to you. Lunchtime was at school and anyone caught throwing food or making a huge mess got detention. Dinner required washing up, sitting up straight, keeping elbows off the table, eating without slobbering and only speaking when spoken to. Fortunately in my family I got to do a lot of speaking. When you mention these things today, young people especially look at you like you are a death camp survivor. When my kids were in school not all that long ago, there was a huge controversy over implementing uniforms, which were nothing more than khaki bottoms and golf shirts. To hear it, you’d think the school was asking for permission to use thumbscrews and corporal punishment. For parents the uniforms make life easier on laundry day, though some of the kids get upset if they can’t show off tatoos and hang their butts out of baggy jeans. By the way, that whole baggy pants thing originated in prisons as a way to let tough guys know you were “available” for playtime. Just to be clear, I really don’t care for a return to Victorian times. My generation helped loosen things up, but honestly they’ve gone too far. 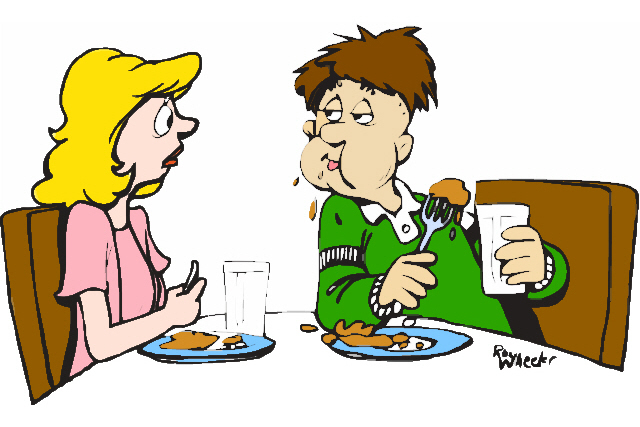 It’s just plain disgusting to sit in a restaurant and watch the person next to you eat like they just came out of the wilderness, or to have a dinner guest who shovels food like there’s no tomorrow. A small amount of decorum won’t kill anyone, but it does help us all get along better. The same thing goes for “please” and “thank-you,” two words quickly disappearing from the English language. Northerners, of which I used to be one, often mock the south because they still insist on being polite and say “sir” and “ma’am” a lot. Basic manners were not invented to enslave society but to make it work better. People who are polite to each other, whether it’s a bit of fakery or not, tend to get into fewer fights and cause less tension. Manners definitely help lubricate the grey area where one person’s rights end and another’s rights begin, the most common cause of arguments among strangers. This entry was posted on November 24, 2012, 4:38 pm and is filed under The Backstory. You can follow any responses to this entry through RSS 2.0. You can leave a response, or trackback from your own site. I’m always polite, even on the road. I do enjoy letting a driver know they’re number 1 on occasion.